Grace, I can always count on you for a good chuckle. I made it through the post but who is Tina Frey? Muffins look good and so glad you left out the almonds. 30 rock is so funny, I'm never sure why, but wait about 20 seconds and something funny is sure to be said or to have happened. Serve over the sorbet with fresh blueberries and a sprig of mint. Those look like they are just packed with blueberries! Blueberry muffins are my favourite, and these look great. Mmmm! You and Tina Fey, hilarious! Great looking muffins. I have no idea who Tina, Rock, Floyd, Liz or Jack are, but I know all about Mrs Lemon and Mr Blueberry - and they get voted through every time in my house! Now, stop hogging the muffins and pass them over here! You are just too funny. Thanks for the humor. Just what I needed on this chilly, wet day here in the Dairy State. These muffins look divine. Yea to Friday! These look great, who doesn't like lemon and blueberry. Yum, lemon and blueberry - a fantastic combination. And thanks for the chuckle. Very funny! Love Tina Fey and totally get the lemon connection:) Great looking muffins. You are hilarious. I would love these, really. Let's bake our stuff and then FEDEX it across the country. Is that blueberry bursting? What are you doing to me? Your muffins *are* pretty!! And you're right--blueberry and lemon is a classic and delicious combination. You muffins ARE SO PRETTY! I love em'. I prefer blueberry over blackberry. No doubt about that. I've watched 30 Rock a couple of times, recently. I thought it was really funny. I need to go watch the older episodes. Love it! It's coffe time right now and I wish I had one! Haha I was wondering what 30rock had to do with muffins. 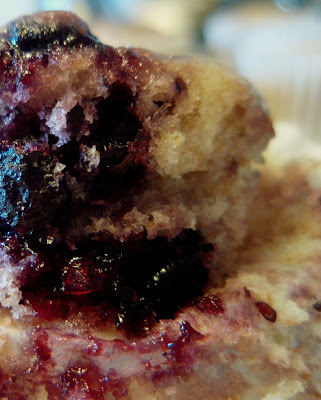 I must say that the close up pics of the split muffin have made me hungry-and I've just enjoyed a big dinner! Grace I need one of these bad. Grasping at straws is a hobby of mine. Citrus and berries are just meant to be together. Period. These look incredible! And so funny--I just bought the stuff to make lemon blueberry cupcakes this weekend! Wow these look wonderful...with a happy ending! My muffins I had last night were anything but happy! Thanks for visiting my site..I honestly never thought to eat all the goodness off of the cupcake liners..I was just a a serious Joan Crawford rage!!!! i must agree with you, 30 rock does rock, and your muffins look like they rock too! This sounds like a really yummy combo. You're right, it seems lemon and blueberries should go together; I can taste it already! Thanks for the idea. 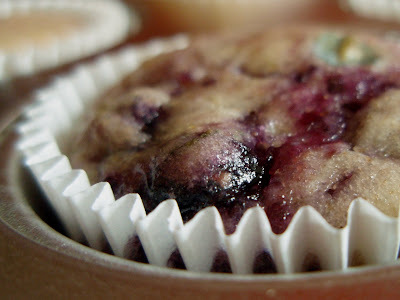 I've been craving blueberry muffins for about a week now, I think I'll make some like these later tonight :). Hope you're having a restful weekend :D! yum, those muffins look so good! Can you mail me one of those? I think it is exactly what I need right now. Yum. have you seen the 30 rock about the sandwiches that the teamsters bought and how she ate it at the airport? the genius of tina fey... and the muffins look good too. Those muffins look really good! I am looking forward to the blueberries. I just love my muffins and aside from looking mouthwatering delicious they are also on the healthy side - not too much sugar and fat. Using preserves is a nice way to add sweetness and flavor. You had me at Liz Lemon. I miss Tina Fey doing weekend update heck I miss when SNL was actually watchable. Atleast 30 Rock manages to make me die of laughter everytime. This sounds really cool and smart move on not scraping through for almonds. I love the sound of this without the almonds. Tina Fey is my hero! And "30 Rock" is one of the best shows on TV - hands down. I LOVE all the jokes about Liz and food. These muffins look amazing - and I agree that the mere mention of lemon is enough of a justification to talk about "30 Rock."